Levenhuk market their collection of Rainbow binoculars as low costing, stylish and versatile compacts that they say are ideal for those with an active lifestyle and that these bins are perfect for hiking, walking, taking to sports events as well as being a great traveling companion. 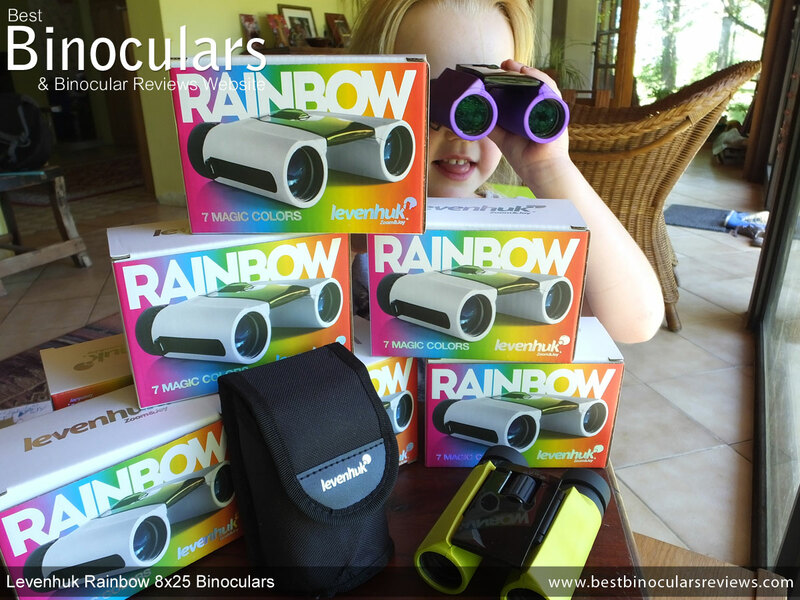 I guess the first place to start is the area in which this series of Levenhuk Rainbow binoculars are most striking and that is their seven different bright colors, which means that most people should be able to find one that matches their personality, or even their outfit! In fact this may not be as funny as it sounds as I can see that a Rainbow will make a great choice (due to their very compact size as well as a number of other attributes that I will discus later on) as the bin to take to sports like horse racing or tennis, where at events like the Grand National or Wimbledon, style is very important. Currently the 7 different available colors are: White Snow, Red Berry, Orange, Lime, Lemon, Blue Wave and Amethyst. Note it is only the two barrels that are coloured, the central bridge, eyepieces and a few other details are black. Whilst you can see from the image below that my daughter immediately singled out the purple Amethyst one as her favorite, for me the only disappointment is that there is not an all black version for a more subdued look. However to be fair to Levenhuk, I think the whole idea of the series was to have a little fun and if you prefer a less bright option, the white version maybe a good option to go for. For a compact binocular, these Rainbow's have what is my favorite double hinge body shape. I say this because the straight through barrel shape of the roof prisms combined with the two hinges that connect the flat top bridge to the barrels not only allow for a larger range of adjustment when adjusting the eyecups to match the distance to that of your eyes (IPD), but this design also enables them to be folded up into a much smaller shape than what is possible with a roof or porro prism bin that have only a single hinge and so this double hinge design makes them far more portable when not in use. For more on this take a look at the section below on their dimensions. 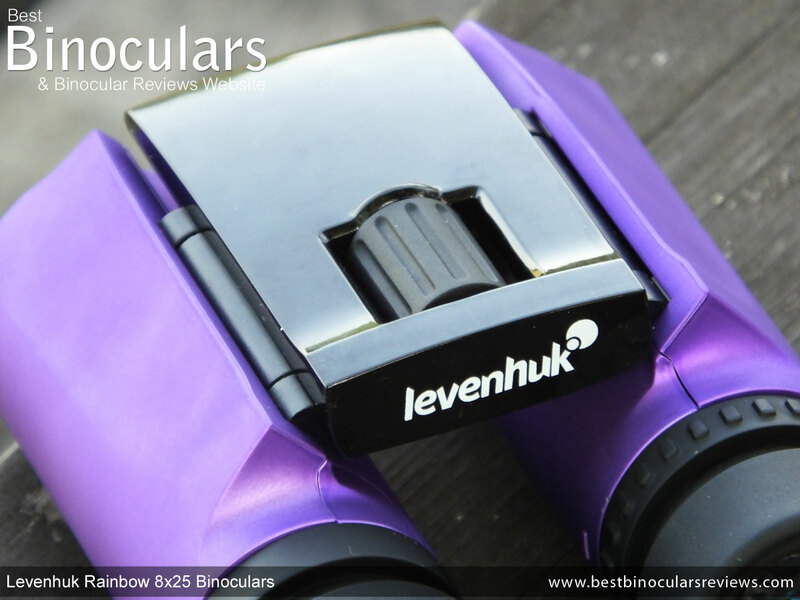 These Levenhuk Rainbow binoculars do not have an external rubber armouring as most modern bins do. Instead the colored sections of barrels have a fine powder type of coating that that does make for a really smooth and I have to admit, somewhat pleasant surface to the touch. Whilst the central bridge has a shiny and very smooth black plastic cover over the chassis underneath. Obviously not having even a thin rubber coating means that the optics will be a little less protected than those that do and if you are not careful, I guess the power coating finish would be easier to mark by scratching than if it was a tough rubber coating. Rubberized coatings also make dampen down sounds and make the exterior surface a little less reflective, both important features should you wish to be stealth or remain hidden. 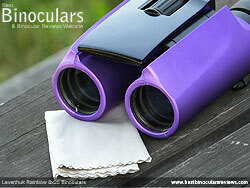 However that is not the aim of these bright and shiny binoculars, the aim her is to stand out and be noticed. This should you be looking for a bin for hunting or surveillance, be that for wildlife or security, I personally would not choose these. However if you want a bin to stand out and even be a fashion accessory, then for many these will look far better than a drab army green or black instrument. Levenhuk do not mention as to what the main chassis is fashioned from, however to me it looks to be mostly a very hard polycarbonate, which at this price is to be expected. The advantage of this is it is cheaper to produce as well as lighter than metallic ones, but is not quite as strong. Again it once again a little like horses for courses in that this is probably not the type of bin that needs to be super tough or rugged and survive being thrown about in all conditions. 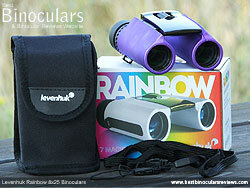 Having said that I was glad to see that these 8x25 Levenhuk Rainbow binoculars are fully water and fog proof. So even though these may not be the toughest bins out there, the fact that they have been sealed means they can be confidently used in the rain and it will almost more importantly prevent any small dust particles from getting inside. Located within the central bridge the focus wheel, like most double hinge compacts is comparatively small. Indeed the one on these has a diameter of approximately 12mm, whilst many single hinge compacts, with a rear mounted focus wheel have much larger wheels. 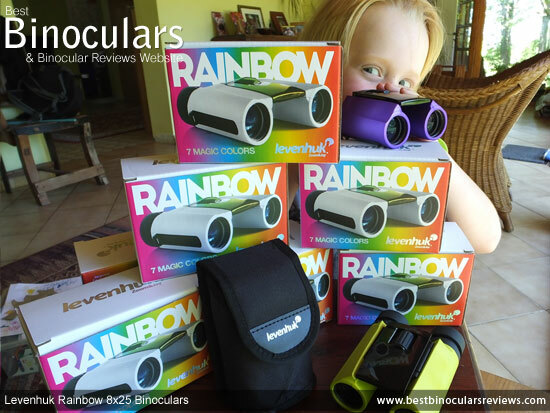 For example take their own Levenhuk Energy PLUS 8x25 binoculars, which has a wheel that is more than double in size at 27mm in diameter. The main advantage of this is that it makes it much easier to accurately turn when using thick gloves on in winter, but I would suggest that for the most part and for the kind of conditions and uses that this instrument is designed for, this smaller wheel is easy enough to reach and accurately adjust as long as you are not using gloves. The ring just under the right eyepiece is for adjusting the diopter. 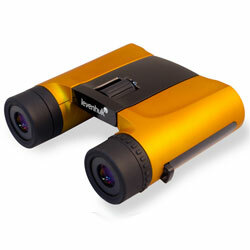 This enables you to calibrate the instrument to allow for any differences in vision between your two eyes. In theory and should you not share your bins with anyone else, this adjustment only ever needs to be done once when you first set up the binoculars. Thus it is important that it does not move too easily as it will prevent it from happening to frequently by accident, which can become a little annoying. The good news is that whilst it is not lockable as you sometimes find on higher end optics, the diopter adjustment on my sample had a good amount of resistance, yet was still smooth and easy enough to deliberately adjust. I was glad to see that Levenhuk have used twist-up eyecups on these compacts as many within this price range will simply have folding rubber cups that usually offer a far less precise way of adjusting the amount of eye-relief that you use. However the cups on the first pair that I tested turned far to easily, meaning that they would often roll down by accident. This became a little annoying, so I checked the other 6 samples that I was sent and am glad to confirm that they were all far better in that they had more resistance to the twisting action, with the result being that they would stay in position. So I can only hope that the one that I first used was an anomaly. 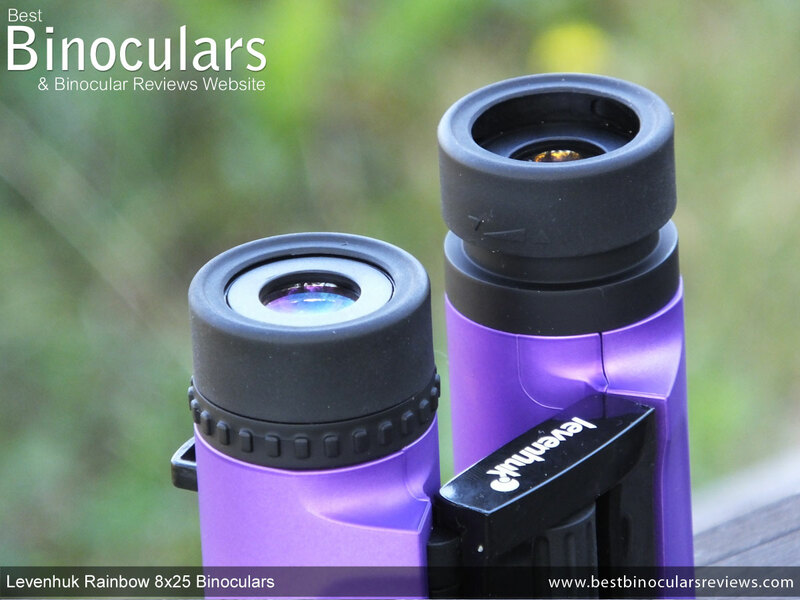 Unlike the body, the eyecups do have a rubber coating, combined with a diameter of 33mm that is a reasonable size for a compact, I found them to be adequately comfortable. Their length of 10cm is achieved with the eyecups fully retracted, by twisting them out it gives the instrument a maximum length of 10.6cm. The 6.5cm width is whilst they are completely folded, where I actually measured it to be 6.7cm. By opening the hinge to the maximum IPD setting, their width becomes 11cm. 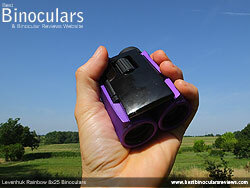 The 4.5cm height reading is taken whilst they are folded, open up the binocular an this decreases slightly to about 4cm. Whatever the case and no matter what state you have these in, they are a very compact binocular, but it is because of the double hinge design they are able to fold up into a really compact shape that is much smaller than single hinge compacts and which is why I call these a true pocket binocular. 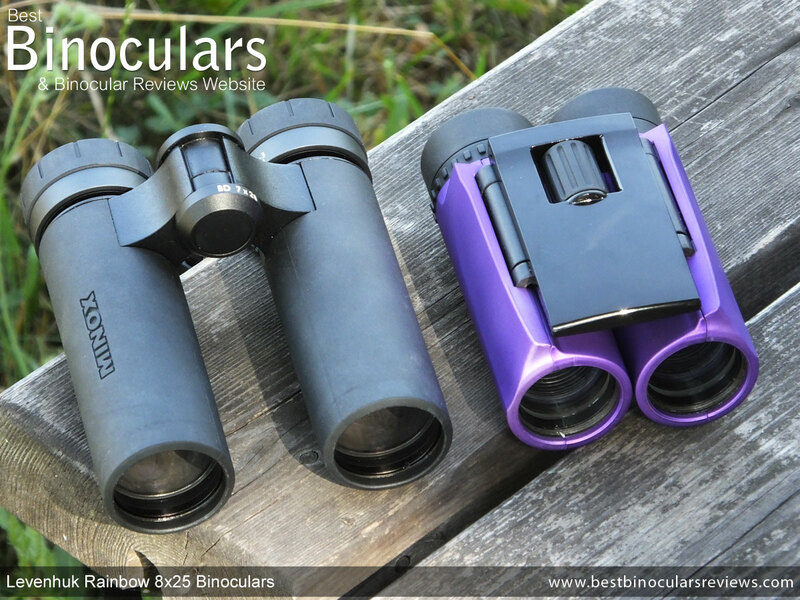 For more like this take a look at this section on the best compact pocket binoculars where you can view other double hinge compacts that I have fully reviewed. 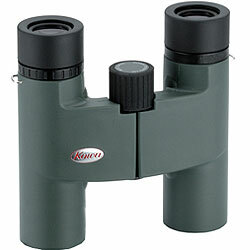 The other major advantage of this double hinge design is that when it comes to adjusting the distance between the eyecups (IPD) to match that of your eyes, you get a far wider range of adjustment than those with only a single hinge. 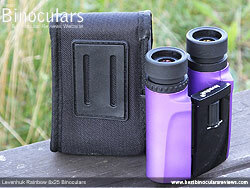 The maximum IPD on these is 7.6cm, whilst the minimum distance you can set the eyecups is a tiny 3.5cm. This means that these should work for most people and be especially good for those with closer set eyes, like children and sometimes women. As we can see that the ocular and objective lenses are in line with each other and thus these compact Levenhuk Rainbow binoculars have a straight through optical path, we can infer without looking at the details that that they use roof prisms for correcting the inverted image after it passes through the objective lens. Indeed Levenhuk do confirm this as well as telling us that they are made from BaK-4 glass which is good as it is considered by most to be superior to the BK7 glass prisms that you often see being used on instruments at this price level. 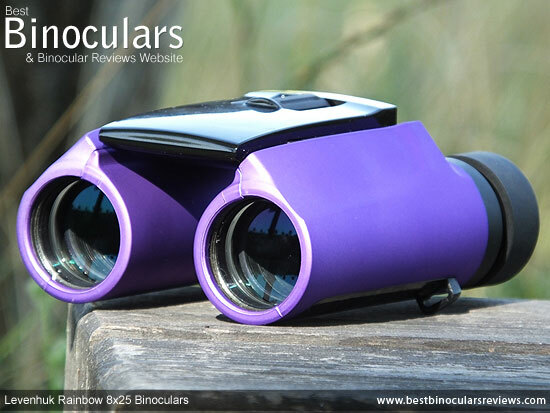 This is because BaK-4 glass has a higher refractive index and thus can (on a binocular) usually be designed to deliver a brighter higher quality image. Levenhuk specify that the lenses in the eyepieces are made up of 7 elements arranged into 3 groups but do not go into any further detail, so all I can report is that the external ocular lens has an diameter of 14mm, which is fairly typical (if a little on the small side) on a compact bin of this size. Compact binoculars come with objective lenses that range in size from around 18mm to 28mm in diameter. Thus with their 25mm objectives, these Levenhuk's occupy the middle ground and so for a compact should provide us with a nice balance between size and light gathering ability. 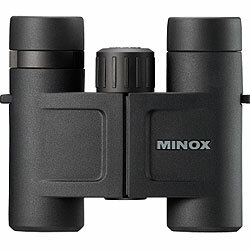 8x25mm binoculars will in theory produce a shaft of light exiting the ocular lens that is 3.125mm in diameter (25 ÷ 8 = 3.125), whilst smaller compacts, like a 8x18mm will only have a 2.25mm exit pupil (18 ÷ 8 = 2.25), which means they deliver less light to your eyes. Whilst larger instruments like a 8x28mm for example with their 3.5mm exit pupils will deliver slightly more light. 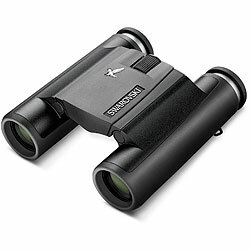 When our pupils are only dilated to a diameter of about 2 to 4mm in good light, the small shaft of light exiting a compact is not really a limiting factor, however in bad light where our pupils increase in size to around 7mm, binoculars with bigger exit pupils will still be supplying our eyes with enough light for us to see a bright image, whilst small exit pupils will seem to be darker. So in conclusion, in relation to other compacts these are potentially (also depends on many other factors including the quality of the glass and coatings) decent to good low light performers. If low light performance is important to you, you may wish to sacrifice a little on size and opt for a larger device - something like a mid sized 8x32 is popular. Right from the outer objective lens, every time light comes into contact with a surface of glass throughout the optical system, there is the potential for it to be reflected away in an undesired direction, which left unchecked will reduce both quality and brightness of the final image. Ultra-fine coatings of an anti-reflection material added to some or all of these surfaces can really help. The best bins are what we call "Fully Multi-Coated", which means that every surface has multiple coatings of this material. 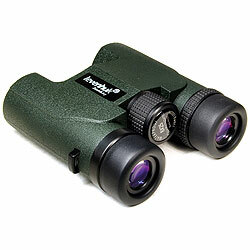 To keep costs down, lower priced optics will sometimes use less coatings on fewer of the glass surfaces. These Levenhuk Rainbow binoculars are "Multi-Coated", which means that only some (usually the outer surfaces on the objective and ocular lenses) have multiple coatings. 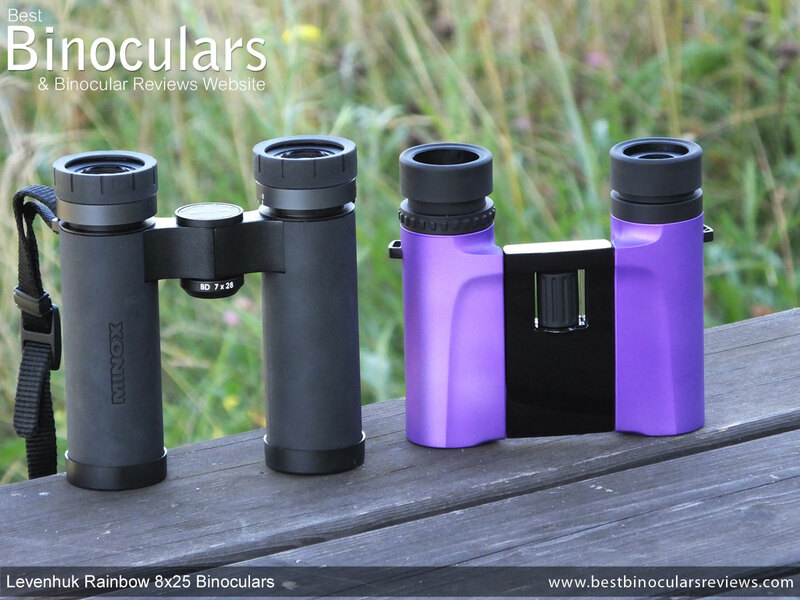 Whilst this is obviously not quite as good as Fully Multi-coated optics, it is better than single coated or untreated optics. The performance of a roof prism can also be improved by adding coatings to it. Firstly a highly reflective material can be added to the one surface that does not naturally reflect all the light that hits it to increase the light transmission levels and secondly they can have a phase correction coating added that keeps the lightwaves in the correct phases and thus improves image quality. As Levenhuk do not highlight any of these and because of the price level of these bins, I will assume they are not phase corrected and use an aluminum mirror coating which is fairly typical at this level. A real highlight of these Levenhuk Rainbow binoculars is their really wide field of view (FOV): At 1,000 yards away, the width of the view you see is 399ft wide (133m at 1,000 meters). As is clearly demonstrated by the comparisons in the table below, this is extremely wide for an 8x compact and is even better than iconic compacts like the Swarovski CL pocket. 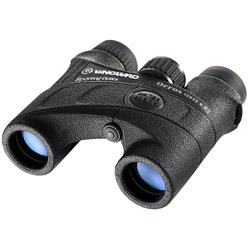 This wide FOV has many advantages, but makes it much easier and quicker to locate what you want to see and in the case of things like small, fast moving and erratic birds, much easier to follow. For uses like outdoor sports and even wildlife observation, you also get to see more of the whole picture without having to move the view about, which can be very important. 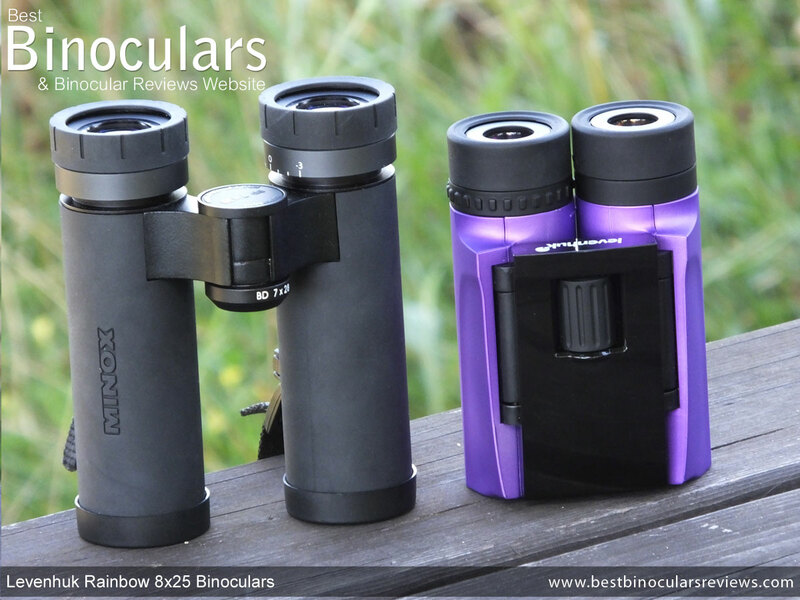 At 16ft away the minimum focus distance is anything but close and thus I would not recommend these to anyone who may be interested in observing objects from closer ranges. This will include things like flowers, butterflies and even paintings in a museum. 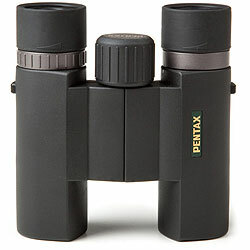 If this is your interest there are many compacts with far closer ranges, or you could opt for a bin like the Pentax Papilio 8.5x21 binocular that is specifically designed with a close focus in mind. Whilst most compacts offer less eye-relief than full sized bins, the 10mm you get with these Rainbow's is still a comparatively small amount and is one of the payoffs to having such a wide FOV. For those like me who don't use glasses, this will not really be an issue. But should you have to use your glasses whilst binning, this may be a problem and you are probably better off looking for a compact will a little more eye-relief. In the optical components section above, I wrote about the relationship between the exit-pupil and the size of your pupils and how, depending on the available light, they play a part in the perceived brightness of the image. I also discussed how the quality of the glass and it's coatings also play a part in not only the brightness, but also the quality as well. To me the image you see through this Rainbow looks neutral, meaning that the colors are normal and lack any sort of tinting that I sometimes see, especially in lower cost instruments where they have used cheaper glass that can produce a slightly yellowish image. 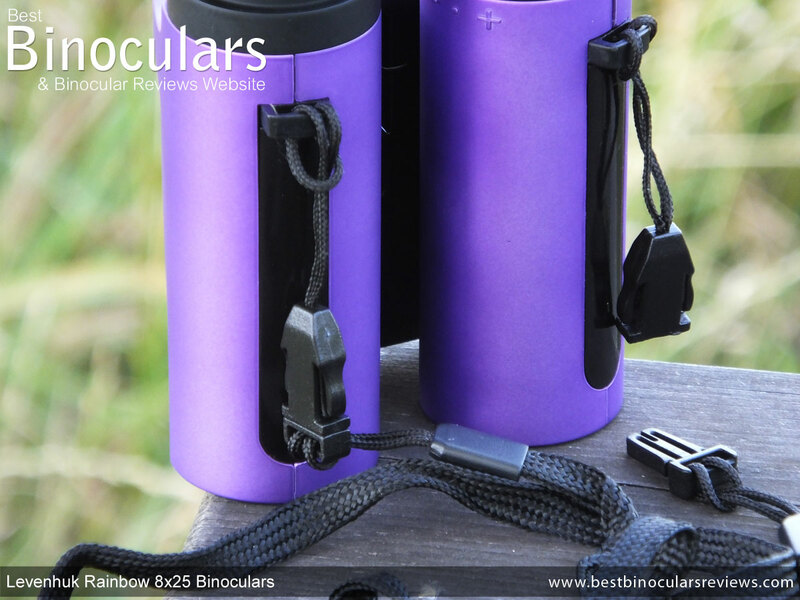 Both the colors and the contrast matched that of my 10x26mm control bin which is good, but as to be expected when comparing them to my mid range 8x42 binocular, the image was noticeably a little less vivid. Under these conditions I thought that they were equally as bright as my 26mm control compacts, which is to be expected even though my controls are more expensive, have 1mm larger objective lenses and have fully multi-coated optics as under these conditions both are supplying your eyes with more than enough light. At and just after sunset, I thought that these Levenhuk binoculars still performed very well against my controls and it was hard to detect any major differences in image brightness. 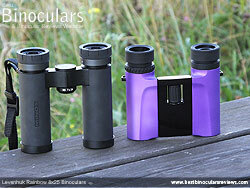 Which considering these use smaller lenses and less quality anti-reflection coatings did surprise me a little. As expected these and my compacts were both unmistakably less bright than my 8x42 controls where the size of the exit pupil really starts to make a difference. 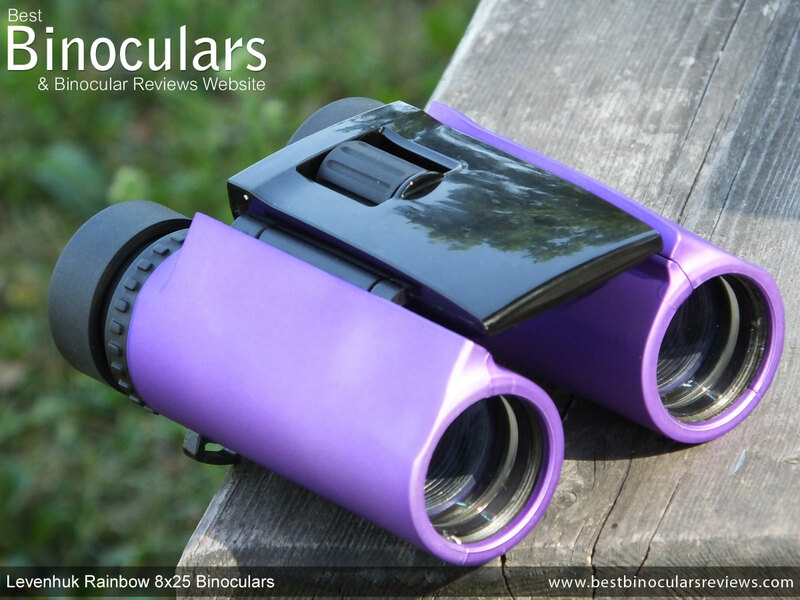 To a certain extent and under the right conditions, you can detect color fringing caused by chromatic aberrations in just about any binocular and that was no different with these. The amount I could observe along the edge of an object that contrasted with it's background was about normal and no worse or better than I would expect to see in a bin at this class. A strong point of these in terms of their image is without doubt just how little softening I could observe right at the periphery of the view. Likewise I thought that the image on a whole looked perfectly flat without any sort of distortions that you occasionally find where the image looks like it is either curving inwards or outwards as you move the view about. Whilst really simple, I really like the tiny carry pouch for these Levenhuk Rainbow binoculars. Once folded, the bins fit perfectly inside and there is enough padding to protect them from all but heavy impacts. The lid is held closed with a small strip of Velcro, which works well and is quick to open and close, but can make more noise than say a clip or even a Zip, which if you don't want to frighten away birds for example can be important. On the rear of the bag is a loop so you can thread your belt through them and carry it from your hip, or if you wish you can thread the neck strap of the bins through the sides of the lid and carry it about around your neck when the bins are inside. Because of their weight and size most compacts do not require a padded neck strap and whilst most of the straps on bins at this price level are just as basic, I was still a little disappointed with the very simple strap that you get with these. 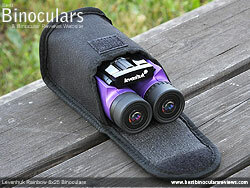 Don't get me wrong, the simple unpadded strap is more than enough for these small bins, it works just fine, is unbulky and I really do like the easy to attach and remove quick release clips, but the fact that the binocular itself is statement in terms of design, it is just a pity that they have not finished it off with a stylish strap to complement this. 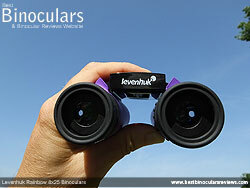 As with many compacts, especially cheaper ones, these Levenhuk's do not come with lens covers. Instead it is assumed that you will just return the bin to it's protective pouch after use. 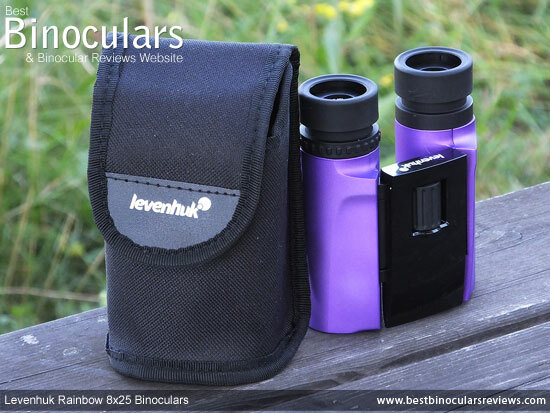 The included Levenhuk Optics cleaning cloth is on a par in terms of quality with that of most others that you get and fine for cleaning the body and if you have to clean the lenses out in the field. 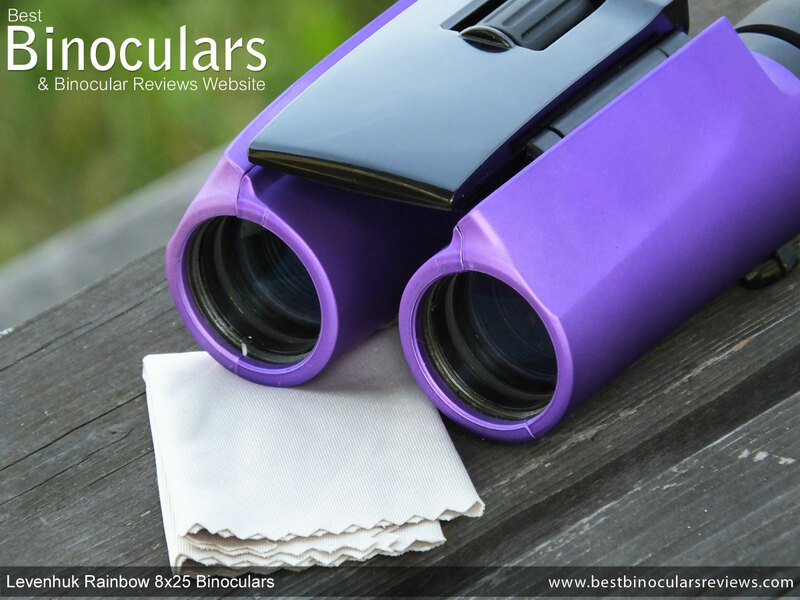 For thorough cleaning of any binocular lenses, I would still suggest that you get a optical lens cleaning kit for the best results and to ensure that the coatings are not damaged. The included instruction sheet is very basic and covers topics like cleaning, setting up the bins and focusing. However also included is details of their Lifetime International Warranty which is excellent. Whilst there will always be some that consider it a weak point, I like the bright colors and the overall finish on these is good and I would say on the whole makes them look more expensive than what they actually are. 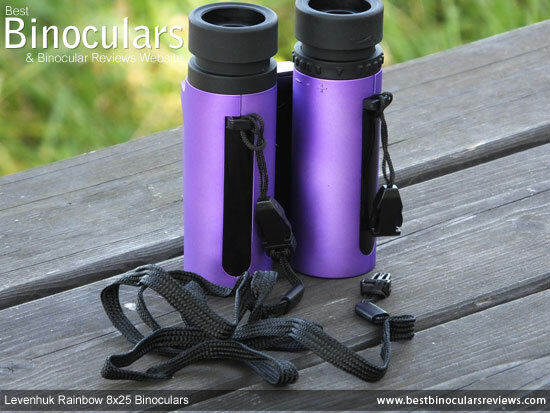 Their shape and the double hinge design makes for a very compact bin, which can then fold down when not in use to an extremely small package, making these a true pocket binocular and ones which can easily be taken wherever you go. The inclusion of twist-up eyecups for a compact at this level is a welcomed addition as is the fully sealed water and fogproof shell. 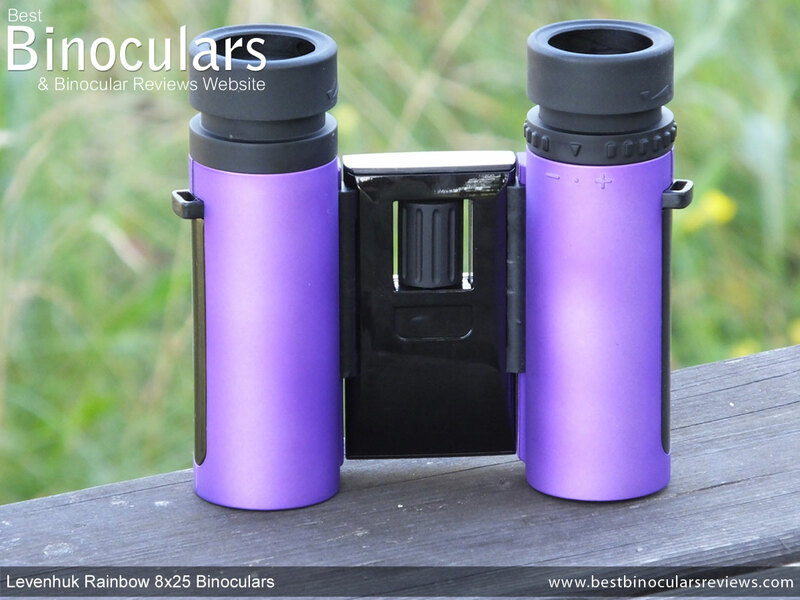 The strongest point however is their very wide field of view which beats almost any other compact binocular that I have come across giving these bins a whole host of advantages in a wide range of areas. 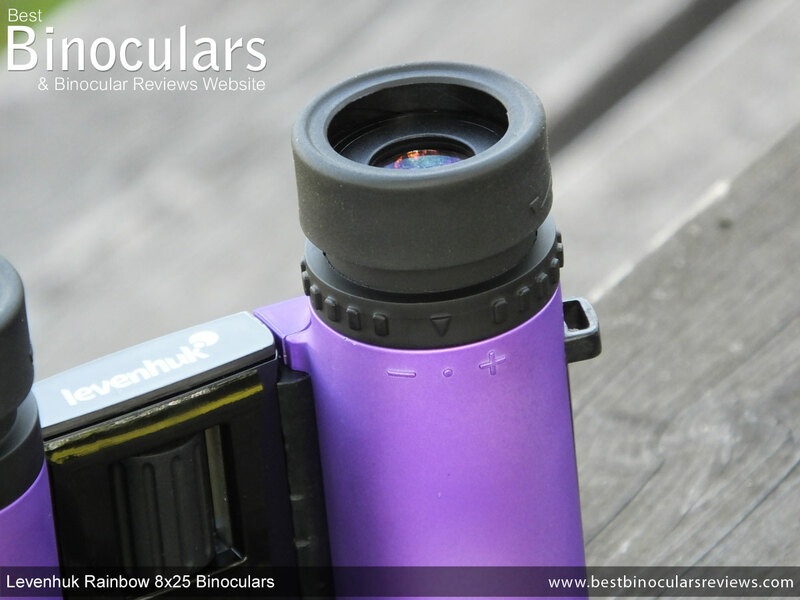 Whilst the wide FOV is exceptional, you do pay for it in terms of both the amount of eye-relief and the minimum close focus distance which has to be said neither are great. If you do not use glasses whilst binning, then the short eye-relief will most probably not be a problem at all and I would never suggest these bins to anyone who is interested in even occasionally looking at objects from closer ranges: butterflies, flowers or even paintings etc at the museum. If this does interest you, you are probably better looking at the section on close focusing bins. 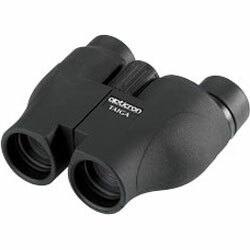 In an effort to keep costs down, one of the compromises was to use multi-coated optics as opposed to the better option of being fully multi-coated. 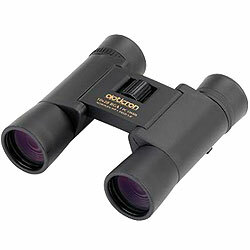 The result of this is a binocular that transmits less of the potential light. In good light this is not a problem, but in low light conditions they are still usable, but are not the best option. As with almost all other double hinge compacts that I have come across, these have a small focus wheel located in the center of the bridge. For the most part this is not an issue at all, but if you plan using them in very cold climates in winter, turning this wheel accurately with thick gloves on is not as easy as those with large wheels. Ideal For: The super compact design, especially when folded make these a true pocket binocular and for this reason they lend themselves to activities like hiking, camping, taking on holidays and possibly even on safari. However due to their small focus wheel, I would not suggest them as an option on a skiing trip or anywhere where you will be wearing gloves even though they are fully water and fogproof. 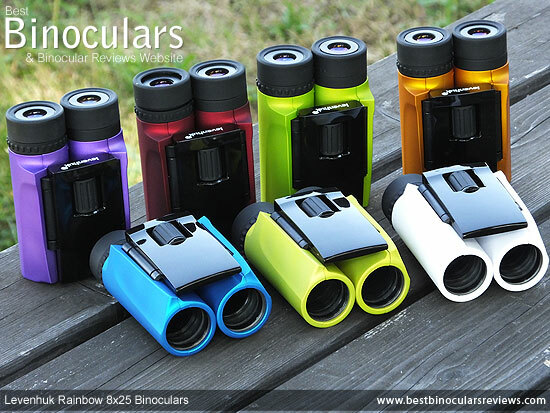 If you include this compactness with the range of colors and include their very wide field of view, then these make perfect binoculars for watching most outdoor sports, especially events like horse racing, cricket and tennis. 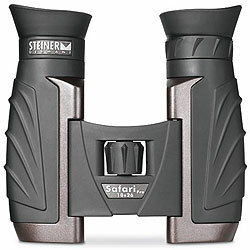 Factor in their small price tag and their very close distance that you can set the eyecups to, then these also make great children's binoculars or for anyone with particularly close set eyes which often includes women.